How To Get Rid of Ringworm? How to Get Rid of Toenail Fungus with Bleach? There is arguably nothing more embarrassing than stinky feet. It is hard to ignore smelly feet and even harder to mask the problem in the middle of a meeting or when you are out for a romantic dinner. Anyone who has ever had the problem will tell how you annoying and mortifying this condition can be. The good news is that the problem is completely fixable. If you would like to find out ways to avoid stinky feet and learn how to cure the problem, read on for all you need to know. It is easier than you think and does not have to break the bank! Even though it can seem like you are the only one with stinky feet, the problem is more common than you think. The Institute for Preventive Foot Health data suggests that around 16% of all adults in the United States, aged 21 or more, have a foot odor issue. And both men and women are equally susceptible to this issue. Your feet have around 250,000 sweat glands; together, these can produce around 500 ml of sweat every single day! Of course, some people sweat more than others and some sweat less. If you are in the first group, you might find yourself encountering a stinky feet problem. Stinky feet, also known as Bromodosis, is usually the result of bacterial build-up. When you sweat, bacteria start to build-up on your skin. This can result in that trademark bad odor from your feet. Some fungi, like the ones that cause athlete’s foot, are another offender responsible for stinky feet in people. Sometimes, going on a detox diet might make your feet seem stinky for a while as your body gets rid of any accumulated toxins and purges them from your system. This problem should resolve itself in a few weeks once all the toxins are out of your system. 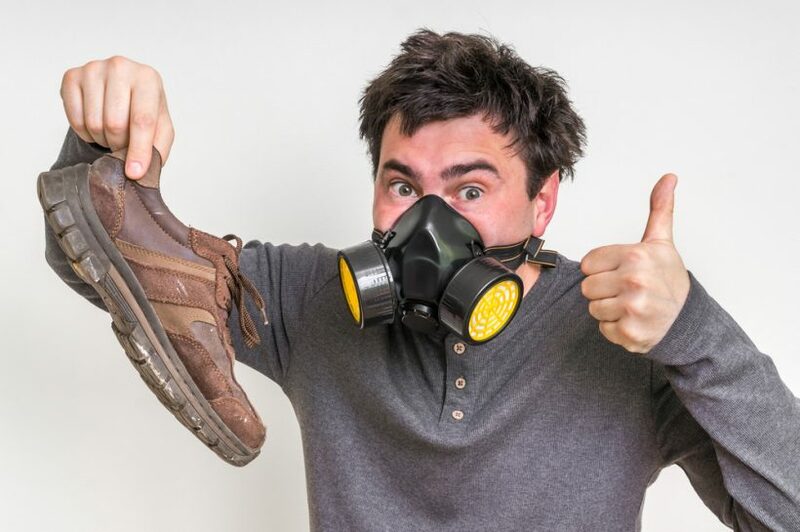 Who’s More at Risk of Stinky Feet? Sweating is a natural phenomenon that everyone experiences. But some people are more likely to develop stinky feet due to excessive sweating or other conditions. Besides this, your habits can also influence your likelihood of having smelly feet. For instance, if you do not dry out sweaty shoes before wearing them again, you could wind up with stinky feet. Elite Shoe Deodorizer and Foot Spray is an all natural foot spray that also moisturizes your feet so that they are healthy and odor-free. When you spray it on, you will also experience a cooling effect that soothes your feet instantly. Each bottle of the deodorizer contains a blend of seven pure essential oils as well as botanicals and herbs like aloe vera, olive extract, ginger, and cayenne that fight bacteria responsible for foot odor. This special non-toxic formulation is made from the highest quality ingredients and is free of harsh chemicals and parabens. The peppermint oil, tea tree oil, coconut oil, and neem oil all have antibacterial properties and are a natural way to fight stinky feet. A simple remedy for stinky feet, Signature Black Bottle Shoe Deodorizer, is a popular choice among those with a smelly feet problem. Easy to use, this stinky feet remedy needs to be sprayed on to keep your feet odor-free. A combination of shoe deodorant and foot spray deodorant, this remedy is a quick fox for all your smelly problems! The essential oils in this deodorizer help to soften skin that’s dry and calloused and soothes the skin it has been applied to. Its minty aroma covers up any existing smells too, and users swear by the silky soft feel it leaves after it has been used. Some say this is the best and most effective shoe and foot deodorizer they have ever used. Ensure your feet are always clean and dry. If they get wet, wash and dry them off, taking care to wipe between the toes – an area that is prone to retaining moisture. Do not wear the same pair of shoes two days in a row, ever. If you do, sweaty shoes from the day before won’t have a chance to air and dry out, and by wearing them again, you’ll increase the chances of stinky feet. Stick to shoes made from leather or canvas and avoid any that are made of plastic. The natural materials allow your feet to breathe. Always wear cotton socks – these have breathable material and are less likely to make your feet sweat. As with shoes, it is important to wear clean socks. Never reuse your socks. Doing that is asking for trouble! Change your socks at least once a day. In other words, if you are wearing socks from morning to evening, try and switch them up to a new pair mid-day if you can. When you wear closed toe shoes, always wear a pair of socks. Trim your nails regularly and slough off dry, thick or rough skin with a special foot file. This kind of skin tends to retain moisture and make the foot damp. Use an antibacterial soap to wash your feet once a day. Wash your sports shoes in the washing machine every couple of weeks. Sprinkle a little baking soda into your shoes (just scatter some over the inside base of your shoe where the foot is in contact with the material). This should help neutralize any bad odors that emanate from your feet when they sweat. Essential oil foot soaks are a tried and tested remedy for stinky feet. Peppermint oil, tea tree oil, eucalyptus oil, and thyme oil are especially beneficial because of their antimicrobial and antifungal properties in addition to the lovely fresh and clean smell they give your feet! Soak your feet in a mix of two parts warm water and one part apple cider vinegar (or regular vinegar if you don’t have apple cider vinegar) for about 15 to 20 minutes. If you have cuts or sores on your feet, this could sting, so you may want to use an alternate remedy. Soak your feet in warm water to which Epsom salts have been added, for about 30 minutes. Dry well afterward. Spray the regular deodorant that you use for the rest of your body onto your feet and in your shoes. Let it air and dry for a moment before slipping on your socks and shoes. Watch your diet! Processed food can cause toxin buildup in the body which can result in unpleasant-smelling sweat. Cut down the amount of sugar you consume – yeast loves sugar and can make you more susceptible to developing fungal infections like athlete’s foot. In addition to these home remedies, there are a number of products like the Elite Shoe Deodorizer and Foot Spray or the Signature Black Bottle Shoe Deodorizer we have just told you about, designed to help people with stinky feet. These include deodorizing powders for the feet, medicated insoles that you can slip into any pair of shoes, and even antibacterial socks. A little hygiene and care go a long way when it comes to curing stinky feet. So, arm yourself with a clean pair of socks and shoes, maybe a helpful home remedy or two, and go out and face the world with great smelling feet! How to Improve Circulation in Feet and Toes - 10 Things You Can Do Today! ← Why Do I Have a Black Spot Under My Toenail? My name is Wayne Day and I created this toenail treatment blog to help others finally get rid of their annoying toenail fungus and other foot-related ailments. See after having problem with fungus on my toe for many years. I decided to put together this site to act as a resource for all of the treatments that are proven to give people results! Feel free to read more about us here. ( toenailfungusonline.com ) is a participant in the Amazon service LLC Associates Program, an affiliate advertising program designed to provide a means for site to earn advertising fees by advertising and linking to Amazon.com programs. These fees will not increase your purchase price, which will be the same as any direct visitor to the merchant’s website.